Passing over Interstate 40 along Briley Parkway (SR 155) leading north from Nashville International Airport (BNA). Photo taken April 4, 2013. Tennessee 155 forms a 35-mile long belt route around central Nashville. The 21-mile portion north of Interstate 40 consists of a full freeway (Briley Parkway). Leading south from the west end of Briley Parkway at I-40, SR 155 transitions into a five-lane commercial boulevard along White Bridge Pike through the White Bridge community. Woodmont Boulevard extends the route east from U.S. 70S (Harding Pike) along a two-lane road to the Woodlawn Area, Woodmont Estates and Battlement. Thompson Lane expands SR 155 into a four-lane arterial across U.S. 31 (Franklin Pike) and Berry Hill. Briley Parkway takes over as SR 155 turns north from Woodbine and Glencliff to Glengarry and western reaches of Nashville International Airport (BNA). This stretch of the route comprises an at-grade expressway. Construction at the west end of Briley Parkway added high speed flyovers in a two phase project. Completed in 2005, the first phase included the new flyover ramp from I-40 west to SR 155 north and from SR 155 south to I-40 east. Funding issues delayed the start of the second phase until money was made available from the American Recovery and Reinvestment Act (ARRA). The $32-million Interstate 40/White Bridge Road Interchange Modification Project ran from July 2009 to August 2011.1 It added flyover ramps from I-40 east to SR 155 north and a new ramp from Briley Parkway south to Interstate 40 west. Work also replaced the White Bridge Road overpass and a nearby pedestrian bridge above the I-40 mainline while adding five retaining walls. The freeway portion of SR 155 along Briley Parkway was complete from I-65 southeast to I-40 by 1985. 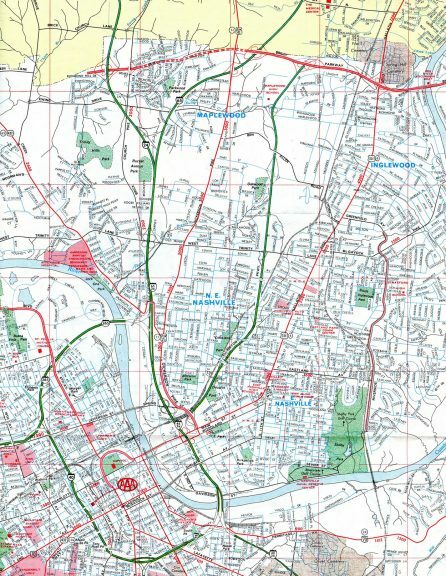 A short connection was also open between I-24 and adjacent Brick Church Pike. The flyovers from Interstate 40 combine to form the freeway beginning of Briley Parkway north as SR 155 ties in from White Bridge Pike. Photo taken 04/05/13. Tennessee 155 (Briley Parkway) winds northwest along side Richland Creek. A six-ramp parclo interchange (Exits 26A/B) joins the freeway with Centennial Boulevard in a half mile. Photo taken 04/05/13. SR 155 is signed north-south on the alignment from Cockrill Bend to Jordonia. Photo taken 04/05/13. John C. Tune Airport (JWN) and the Tennessee Department of Transportation (TDOT) lie just west of Exit 26B via Centennial Boulevard. The general aviation airport was constructed between 1983 and July 1986. Photo taken 04/05/13. Centennial Boulevard east leaves the industrial area of Cockrill Bend for the Nations neighborhood and Dr. Walter S. Davis Boulevard to Tennessee State University. Photo taken 04/05/13. Exit 26A departs Tennessee 155 (Briley Parkway) north for Centennial Boulevard east. A loop ramp follows for TWN Airport. Photo taken 04/05/13. Centennial Boulevard west turns north and parallels SR 155 to a number of industrial businesses east of the airport and the Carlex Glass Company manufacturing plant. Photo taken 04/05/13. Tennessee 155 turns eastward ahead of the Cumberland River. Photo taken 04/05/13. A parclo interchange (Exit 25) joins Briley Parkway with County Hospital Road in one half mile. Photo taken 04/05/13. County Hospital Road arcs east from the entrance to the Tennessee Clay Target Complex at Exit 25 to the Bordeaux section of north Nashville. Photo taken 04/05/13. The 688-mile long Cumberland River flows west from the Appalachian Mountains in southeastern Kentucky across northern Tennessee to a mouth at the Ohio River by Smithland, Kentucky. Photo taken 04/05/13. The Andrew B. Gibson Bridge carries Briley Parkway across the Cumberland River between Cockrill Bend and Bordeaux. The span was completed in 1985 and reconstructed in 2000. Photo taken 04/05/13. Exit 25 departs SR 155 (Briley Parkway) north for County Hospital Road east to John Mallette Drive near U.S. 41A (Clarksville Pike). The road name derives from the former Davidson County Hospital, which is now Kindred Hospital Nashville. Photo taken 04/05/13. Tennessee 12 (Ashland City Highway) emerges from a hidden concurrency with U.S. 41A (Clarksville Pike) at Bordeaux. The state route turns west from there to cross paths with Briley Parkway at Jordonia en route to the Cheatham County seat of Ashland City. Photo taken 04/05/13. The Exit 24 guide sign for SR 12 at the diamond interchange with Ashland City Highway was knocked over in 2009 and never replaced. 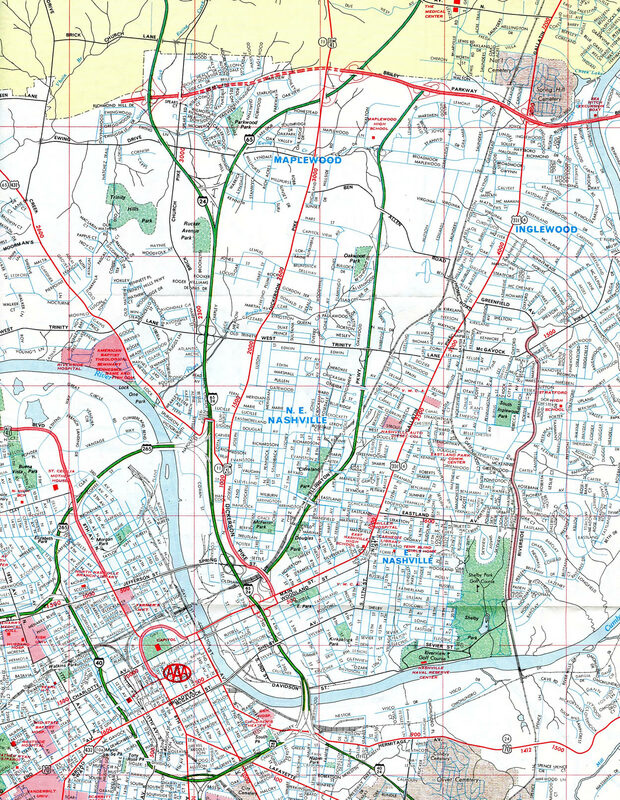 SR 12 begins in Downtown Nashville, where U.S. 41A splits with U.S. 31-41-431, and ends a 62-mile route again as the counterpart of U.S. 41A at the Kentucky state line in Clarksville. Photo taken 04/05/13. Northbound reassurance marker for SR 155 posted after SR 12. The Jordan Ridge and Creekside Trails subdivisions overlook Briley Parkway just beyond the adjacent Cato Road overpass. Photo taken 04/05/13. Briley Parkway cuts through a series of hills east of Eaton Creek. Some of the hills top out over 800 feet above sea level. Photo taken 04/05/13. Passing through a cut west of Drakes Branch along SR 155 east. Photo taken 04/05/13. U.S. 41A (Clarksville Pike) extends north from SR 12 at Bordeaux to meet SR 155 (Briley Parkway) at a six-ramp parclo interchange (Exit 21) in one mile. Photo taken 04/05/13. Leading northwest from Exit 21, U.S. 41A (Clarksville Pike) traverses a hilly route to Germantown. The US highway parallels the I-24 corridor to Clarksville. Photo taken 04/05/13. U.S. 431 (Whites Creek Pike) joins Tennessee 155 with a number of subdivisions to the south including Haynes Manor, Haynes Heights and Trinity Hills to its eastern turn along Trinity Lane. Photo taken 04/05/13. Reassurance markers for SR 155 are now marked east-west. Briley Parkway crosses Whites Creek next. Photo taken 04/05/13. Entering the diamond interchange (Exit 19) with U.S. 431 (Whites Creek Pike) on SR 155 east. U.S. 431 ventures north to Whites Creek, Joelton and Springfield beyond the Nashville-Davidson County line. Southward the US route combines with U.S. 31W & 41 toward Downtown. Photo taken 04/05/13. A full cloverleaf interchange (Exits 18A/B) lies one mile ahead with Interstate 24. Photo taken 04/05/13. SR 155 kinks northward along side the Brookview and Golden Valley subdivisions to the ramp departure (Exit 18A) for Interstate 24 east back into central Nashville. Photo taken 04/05/13. I-24 east combines with Interstate 65 south in 1.7 miles. The two separate after 1.8 miles to encircle the west and east sides of Downtown Nashville respectively. Photo taken 04/05/13. The short stretch of SR 155 east from I-24 to Brick Church Pike (Exit 17) was opened to traffic by 1985. Interstate 24 winds across hilly terrain to leave Nashville for a 33 mile drive to the outskirts of Clarksville. Photo taken 04/05/13. Interstate 24 west combines with Interstate 69 south in 95 miles at Eddyville, Kentucky. Photo taken 04/05/13. Briley Parkway begins from Thompson Lane, just west of the six-ramp parclo interchange (Exits 3A/B) with Interstate 24. Tennessee 155 travels along a controlled-access expressway east from Exit 3B (Interstate 24 west to Downtown) to Exit 4 (U.S. 41 & 70S). Photo taken 11/04/09. Tennessee 155 (Briley Parkway) upgrades to a freeway as it meets Interstate 24 just northwest of the main runway at BNA Airport. Exit 6B loops away from the state route here for Interstate 40 west leading toward Downtown Nashville. Photo taken 04/05/13. A loop ramp from U.S. 31E (Ellington Parkway) north forms a third westbound lane for SR 155 to Exit 16 for both I-65 south back into Nashville and U.S. 41 & 31W (Dickerson Pike). Photo taken 05/27/11. Interstate 65 travels south to combine with I-24 west for 1.8 miles before turning west to MetroCenter and I-40 encircling central Nashville. U.S. 31W & 41 (Dickerson Pike) parallel the freeway south along a five-lane commercial boulevard to Capitol View and Highland Heights. Photo taken 05/27/11. Westbound reassurance marker for SR 155 posted ahead of the Oakview Drive underpass by the Skyview subdivision. Photo taken 05/27/11. A lane drop occurs in 0.75 miles at the folded diamond interchange (Exit 17) with Brick Church Pike. Interstate 24 crosses paths with Briley Parkway just west of there. Photo taken 05/27/11. Brick Church Pike lines the west side of several subdivisions north from Ewing Drive to SR 45 (Old Hickory Boulevard) at Little Creek. Interstate 24 parallels to the west from its split with I-65 north. Photo taken 05/27/11. Sound walls line Briley Parkway as it bisects the Parkwood Estates subdivision to Brick Church Pike. Photo taken 05/27/11. Exit 17 leaves for Brick Church Pike south to Brick Church Business Park and U.S. 431 (Trinity Lane) at I-24 & 65. Exit 18A quickly follows for Interstate 24 west to Clarksville, Hopkinsville and Paducah, Kentucky. Photo taken 05/27/11. A full cloverleaf interchange joins Tennessee 155 (Briley Parkway) with Interstate 24 at Exits 18A/B. Photo taken 05/27/11. Interstate 24 leads south to run just east of Downtown Nashville parallel to the Cumberland River. This stretch was fully a part of I-65 until 2000, when the route shifted westward over what was I-265. Photo taken 11/04/09. "New flyover ramp on Nashville&apos;s I-40/Briley Parkway Interchange opens." Commercial Carrier Journal, September 18, 2010.